What Kinds of Medical Evidence Might Be Used in My Car Accident Case? When you are involved in an automobile accident in Nevada, if the other driver is at fault for causing the accident, then you have grounds to bring a personal injury claim against the at-fault driver for any damages or injuries that you have suffered because of the accident. Generally in car accident cases, injured parties sue for property damages, i.e., damage sustained to their vehicle during the accident, and damages for their own injuries and pain and suffering. Tto establish personal injury damages for injuries suffered during a car accident, it will be important for you and your personal injury lawyer to establish the scope and extent of your car accident injuries. This is done through various forms of medical evidence. Medical evidence is essentially the foundation of a car accident personal injury case. Medical evidence is used to justify to the court the amount that you are seeking in damages for your injuries. You cannot sue for a million dollars if you only suffered a few small bruises and cuts, but it might make sense to sue for a million dollars (or more) if you suffered a serious brain or spinal injury that will require years of medical care of physical therapy in the future or if the injuries are permanent. The medical evidence needs to support the damages you are seeking. The victim/patient’s medical records and charts. Doctor’s notes or medical reports. Nurse’s comments that are recorded in the patient’s medical record. Scans such as x-rays, MRIs, PET, CAT, etc. Test results from laboratory or blood workups. Patient diagnosis and prognosis prepared by the treating physician. Records of any prescriptions, treatments or surgeries that were required to treat the accident-related injuries. A record of all of the patient’s visits to the doctor’s office. Proper documentation of accident-related injuries through medical evidence is critical to the success of a personal injury claim for car accidents. If you have been injured in an automobile or motorcycle accident, it is important that you seek medical care for your injuries immediately. Keep track of all the medical providers you have seen, and once you have a chance to speak with an experienced personal injury lawyer, you will be able to start building your case based on the medical evidence you have already collected. Personal injury claims depend heavily on good record keeping and detailed medical evidence. 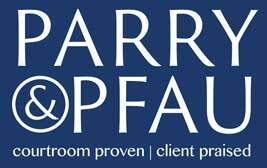 If you have been injured in an automobile accident, it is in your best interest to reach out to the team at Parry & Pfau for help with your personal injury claim. When you are involved in a car accident that is not your fault, you deserve financial compensation for the injuries that you have suffered. We would be happy to offer you a free consultation to discuss your situation. Call us today.